It started in late May. "But since there happened to be die-offs of limited extent during the last years, at first we were not really alarmed," Zuther, the international coordinator of the Altyn Dala Conservation Initiative, told Live Science. "The extent of this die-off, and the speed it had, by spreading throughout the whole calving herd and killing all the animals, this has not been observed for any other species," Zuther said. "It's really unheard of." "Where you find saiga, we recognize also that the other species are much more abundant," Zuther told Live Science. 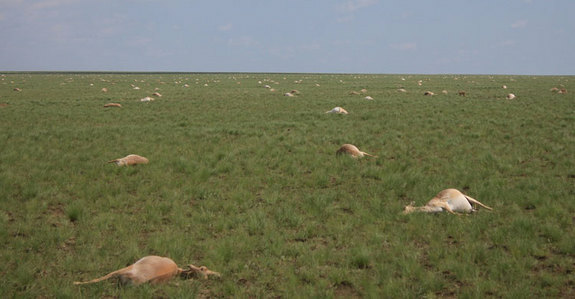 Die-offs of saigas, including one that felled 12,000 of the stately creatures last year, have occurred frequently in recent years. But the large expanse of the country affected by last year's die-off meant veterinarians couldn't get to the animals until long after their deaths. The delay hindered any determination of a cause of death, and researchers eventually speculated that an abundance of greenery caused digestion problems, which led to bacterial overgrowth in the animals' guts. This time, field workers were already on the ground, so they were able to take detailed samples of the saigas' environment -- the rocks the animals walked on and the soil they crossed -- as well as the water the animals drank and the vegetation they ate in the months and weeks leading up to the die-off. The scientists also took samples of the ticks and other insects that feed on saiga, hoping to find some triggering cause. The researchers additionally conducted high-quality necropsies of the animals, and even observed the behavior of some of the animals as they died. The females, which cluster together to calve their young, were hit the hardest. They died first, followed by their calves, which were still too young to eat any vegetation. That sequence suggested that whatever was killing off the animals was being transmitted through the mothers' milk, Zuther said. Tissue samples revealed that toxins, produced by Pasteurella and possibly Clostridia bacteria, caused extensive bleeding in most of the animals' organs. But Pasteurella is found normally in the bodies of ruminants like the saigas, and it usually doesn't cause harm unless the animals have weakened immune systems. "There is nothing so special about it. The question is why it developed so rapidly and spread to all the animals," Zuther said. So far, the only possible environmental cause was that there was a cold, hard winter followed by a wet spring, with lots of lush vegetation and standing water on the ground that could enable bacteria to spread more easily, Zuther said. That by itself doesn't seem so unusual, though, he said.